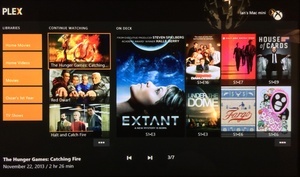 Plex, the home media streaming app, is now available for free on the PlayStation 4 and Xbox One consoles. To date, the apps were available in beta to Plex Pass customers, but now everyone can get their hands on the core app for free (without some of the features paying subscribers get). The setup is very quick, and includes creating a Plex account, downloading the media server to your PC/NAS and then downloading the app on your console. Plex can play nearly any format you have saved and it also catalogs your movies and shows with artwork, descriptions and more. This is nice but a little too late. By now people, like me, have an old tower that they didn't throw away after upgrading to a new beefier pc and are using the old tower to direct play via hdmi to the tv. My old tower is now just a video storage drive that I use to watch and play vids and youtube like a cheap htpc.